In the Bee Yard we discuss configuration, inspections, queen rearing, colony splits and pollinator plants. The Sweet Mountain Farm Russian Bee Yard is shaped in a circle with all entrances facing the center. The configuration is useful for air traffic control. The circle shape for our Russian Bee Yard reminds me of a Torus. It is a continuous surface with a hole in it. The energy flows in through one end, circulates around the center and exits out the other side. In 1984, Dr. Alexi Starobinski along with his mentor, Dr. Yakov B. Zeldovich professors at Moscow’s Landau Institute, conceived a doughnut theory of the universe. Most apiaries are set up so that the entrances face South, however, we are experimenting with the Torus pattern. It seems fitting to use this pattern in our Russian Bee Yard. We see the Torus pattern throughout nature. You can see it everywhere – in atoms, cells, seeds, flowers, trees, animals, humans, hurricanes, planets, suns, galaxies and even the cosmos as a whole, why not recreate it in the bee yard? The bees use this pattern while clustering in winter. The torus is nature’s way to create and sustain life and it can serve as a template for our sustainability. All hive entrances in our Torus face the center. The area is approximately 1/2 acre. Accessibility and serviceability to the back of the hives is maximized with this configuration. The hives are inspected and easily serviced by a pick-up truck that is driven around the outside edge of the circle and can pull to within inches of each hive. An inspection can occur anytime the outside temperature is above 60 degrees. Any colder, and there is a risk of killing brood. We start in the morning about 10:00 a.m. when most of the worker bees are in the field. We stop our inspections about 3:00 p.m. when most of the workers are returning to the hive for the evening. The colonies tend to be more agitated if the barometric pressure is falling. It is best, on days that have a fast approaching weather front, to stay out of the bee yard. We watch the local weather service daily and gauge the possibility of rain so that when a 10 day inspection cycle falls on a predicted rain day, we can adjust our inspection day accordingly. 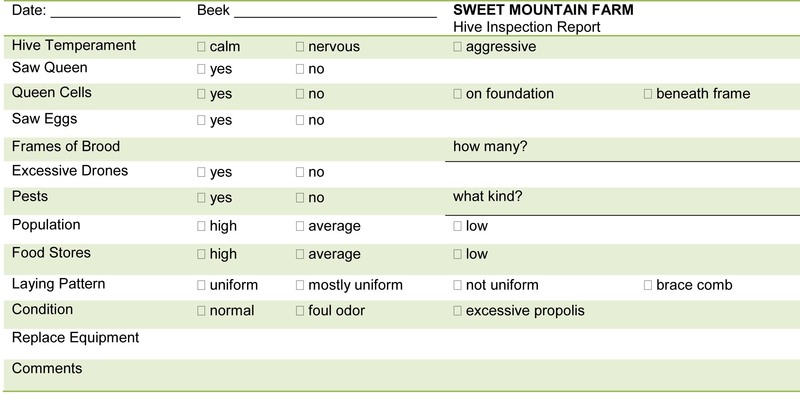 Here is an example of a SMF Hive Inspection Report. One sheet of paper is used for each hive for the entire season. The static information is at the top of the page. Print a copy here. A hive is inspected every 10 days. During the beekeeping year, from Mid May until Mid November, the hives are inspected approximately 7 times. The following information is recorded at each inspection. If a hive becomes queenless, the desperate search is on to purchase a queen before the hive dies out. This is by far the number one reason why queens are purchased without regard for the queens genetics. Breeders, because of demand pressure, do not always carefully monitor the genetics. The result is weak queens. The queens are compromised to meet demand. travel distance and inherent shipping stresses. exposure to cold and hot temperatures that effect the health of the queen. delivery centers that may use pesticides. possibility of Africanized genetics from bees bred in the South. No eggs. Even when a queen is present, if there are no eggs then the hive is queenless. If you have a Russian or Carniolan colony the queen shuts down egg production when resources are low. Look intently for the queen. Only sealed brood present, hive has been queenless for more than a week. If there are no queen cells the colony is not able to raise its own queen. Monitor the resources for 8 days. Cells should be capped by day 8. Honey is extracted at the end of August. The honey supers are taken from the hives and stacked inside the honey house for extraction. The comb is shaved with a hot knife and then loaded into the extractor. The drum spins for several minutes while the honey drips from the drum into a filter. Once filtered; the honey is bottled, capped and labeled. Extraction is an all-hands-on-deck event. The process is slow, hot and sticky. After extraction the supers are placed back on the hives for the bees to clean the comb. After the first frost we remove the empty honey supers for winter storage. 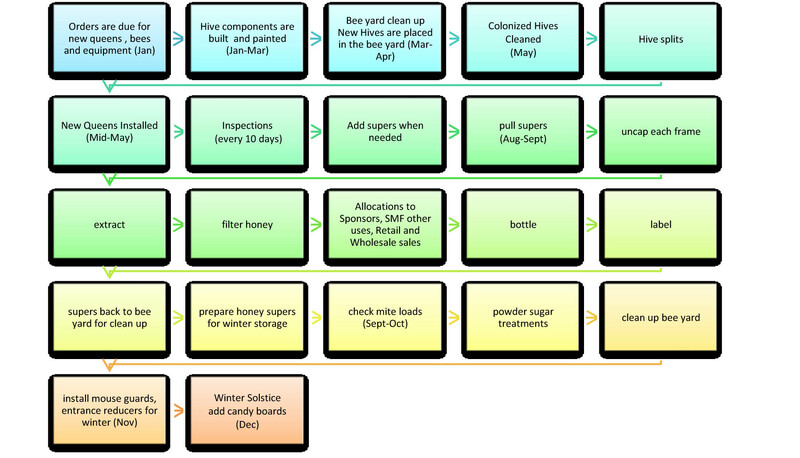 At the winter solstice (between December 20-23), the hives are winterized and the winter candy boards and ventilation system is placed on the hives. Your choice to buy organic products from a local farmer and your willingness to grow bee friendly plants helps to maintain a healthy environment, vibrant community, and a strong local economy. Beekeepers need everyone to help increase the honeybee population. Bees pollinate one third of the world’s food supply yet colonies are disappearing at alarming rates in many parts of the world due to the cumulative effects of parasitic mites, viral and bacterial diseases, and exposure to pesticides and herbicides. 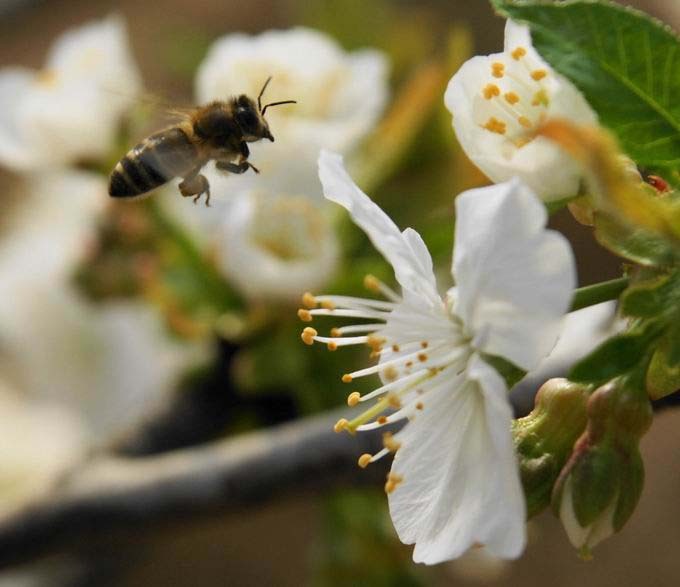 Large scale chemical application is toxic to soil and water, and weakens our honeybees. If you have a yard, the choices you make in your landscape and garden can support honeybee health. Attracting honeybees to a garden will help the productivity of plants through pollination. Plan a garden to provide pollen and nectar sources over an entire growing year. Even on a warm late winter day, honeybees need pollen sources to feed young brood in the hive. Plant for year-round blooming and in relative proximity to a beehive. If dandelions are blooming at the same time as the apple trees, the honeybee will select the nectar that the colony prefers and will fully exhaust that nectar source before moving on. It is advantageous then, to cultivate one crop and plant it en mass. Workers will favor the plants that are closest to the colony. Single blossoms with anther and stamen easily accessed within the petal are better than double or trumpeted blossoms since the honeybee’s proboscis is not very long. What plants do bees see? Bees can see ultra-violet light and favor purple and blue flowers. Bees do not see red flowers but will be attracted to a red flower where ultra-violet light is present or there is high contrast between a flower and its background. What plants are most nutritious? Heirloom and wild flowers provide the most nectar and pollen while hybrids lack sufficient nutrition. A hybrids color may be vivid but its nutritional source leads the honeybee on an unproductive journey. The honeybee is driven to the sunflowers yet new pollen-less sunflowers are marketed for longer living floral arrangements. Bees will pollinate plants that are not native to an area but are inefficient non-native plant pollinators. It is important to select plants that are local. Listed below are plants that honey bees will pollinate effectively. Not all of these plants grow in every location. According to the USDA, Washington Island is in zone 5A. When selecting plants the farm uses zone 4. Find your own zone at the National Gardening Association. If you see a plant not listed in our database below, and it is a bee friendly plant, send us the plant name so that we can build a comprehensive database. (add a plant here).